of course i love the retro groovy fabric. glad i bought it when i did because i believe it is now discontinued. go ahead. make yourself a halter apron today! Wow, even though it's an apron, it looks like it could be a cute top or dress. 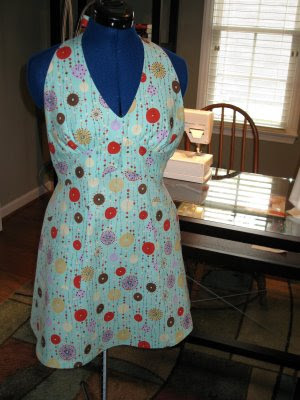 I have been eying that a. henry fabric for a while--an apron is perfect to show it off! Just love it!!! So pretty, it does look like it could be a summer dress, although there probably isn't much of a back. Good job getting that fun fabric before they discontinued it! Oh, and I love your model, I need to get myself one of those! Can't wait to see what you'll be making next!!! There are a few yards available at jcaroline creative and purlsoho.com (on sale!) of this same color and print; Sew, Mama, Sew has it in rose, should anyone be interested. Oh this is pretty - could double as a great summer dress too (if the back were sewn up - hehe). Looks great - have a fantastic day! This is such a cute apron! I agree that it would make such a cute dress (with a few modifications, of course). I love the print. Are you going to keep this one? It is such a great spring/summer apron! that is TOTALLY cute! put a back on it, and wear it as a dress!!!!!! seriously. you are SO ready for sewing clothes.